Lou Williams (3) had 16 points, including 13 in the fourth quarter, but that couldn't keep the Hawks from a fifth straight loss. 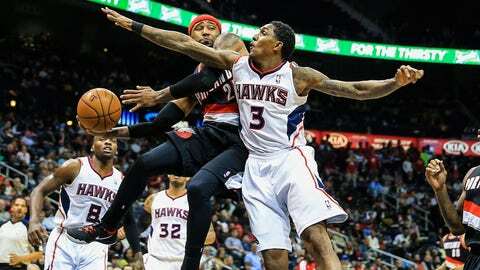 ATLANTA — Three observations as the Hawks fell 100-85 to the Trail Blazers on Thursday night. A fifth straight loss, coupled with the Knicks being idle leaves Atlanta just 1 1/2 games up in the race for the eighth spot in the Eastern Conference playoff race. It’s a precarious spot, but if there’s a silver lining for the Hawks, it’s what they have ahead of them. Granted, the Pacers and Heat remain on the schedule, but the Hawks’ final 11 opponents have a combined record of 355-430 with six teams in playoff position, compared to 388-321 for the Knicks with nine teams in postseason contention. Atlanta also gets the Sixers, who could be going for a 28th straight loss when they come to Philips Arena on March 31 and seven of the Hawks’ games are at home, where they are 20-14 (sixth-best in the East). Meanwhile, New York is on the road six times and is under .500 (14-21) away from Madison Square Garden. Having dropped 19 of the last 25 games, all is far from lost. The Hawks can at least rest assured that the state of the East kept them in the playoff hunt. They only need take advantage of a largely manageable schedule to make sure they stay there. Pero Antic was out with an ankle injury, leaving an already thin Hawks frontcourt that’s without Al Horford and Gustavo Ayon to lean on Elton Brand and Mike Muscala as LaMarcus Aldridge made his return to Portland’s lineup. With the Hawks within six off a 21-foot Lou Williams jumper at the 7:15 mark, Aldridge responded with a three-point play — he hit a five-foot jumper, then drew a foul off Brand to get to the line — to push the lead back to nine. It would be the last time Atlanta would get the close. The Blazers big simply dominated, scoring 25 points on 9-of-21 shooting with 16 rebounds in 32 minutes. It was his first action since injuring his back on March 2. Adding to the troubles in the paint, Robin Lopez had 11 points and seven rebounds and Thomas Robinson banged his way to 10 points. Luckily for the Hawks, Antic isn’t expected to miss much time as he tweaked his ankle while stumbling over a coach on the bench after draining a three-pointer Wednesday vs. Minnesota. Atlanta has another strong big to deal with Saturday in the Wizards’ Marcin Gortat (12.9 points, 9.3 rebounds per). Thirteen of Williams’ 16 points came in the fourth quarter, including nine during an 11-0 run. He cut the Blazers’ lead to six twice (80-74 and 82-76), but he and the Hawks ran out of gas as the were outscored 17-8 the final 5:56. Williams was 5-of-12 (.417) from the field and added four rebounds and four assists, marking the third straight game he’s scored in double figures (he also had 10 points vs. the Timberwolves on Wednesday and 17 vs. the Suns on Monday). It was just the third time this season that Williams had scored more than 10 in three straight games, and the first time in 25 days. Oddly, Williams’ bigger games haven’t been a precursor to strong nights by the Hawks, as they’ve dropped 17 of the 26 games in which he’s had more than 10 points, including each of the last six instances.